In the German eyewear retail landscape, one particular store with an extravagant name has been turning heads over the past few years: Six Million Glasses. 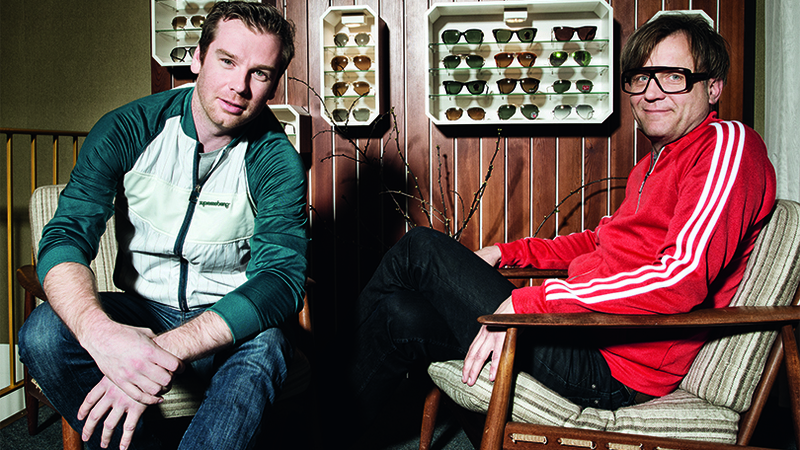 Behind the flashy moniker lies an innovative and efficient concept, created by two brothers: Hauke and Marc Oliver Peters have been selling hand-picked eyewear from cool labels to Hamburg’s prime clientele since 2006. Today, the store – and the brothers – have become a fixed institution in the trending Schanzenviertel neighborhood and beyond. Most customers are greeted by name upon walking into Six Million, and during the photo shoot for this article, the Peters brothers just popped into the boutique next door to borrow some jackets. And since Hauke also travels as a sales rep, he gets the latest insights on the optical business straight from the source. Here’s their unique perspective in this issue’s Retail Profile. Marc Oliver is totally different than myself. Incredibly grounded and down to earth, a great guy with a great vibe. I’m really proud to be his brother. Loud, emotional, creative, reliable, and a hell of a guy. It’s super fun working with him. Hauke, is the Schanze neighborhood in Hamburg still the “place to be”? Hauke: For sure. Despite ongoing gentrification all the other districts such as Wilhelmsburg have not been able to attract a creative scene. The Schanze remains the city’s creative hotbed. You earned your degree in Business Management. Then you took the detour into the optical trade. How come? H: Initially my plan was to end up in the media business, so I took two semesters in Cultural Sciences. But when I became a dad at the young age of 23 in 1991, I decided to change into cultural management and took the Management in Trade program at Bremen University of Applied Sciences, and completed my diploma in 1996. On the side, I was working for a promotions agency as the district manager for Gaulloise and Lucky Strike. And because my daughter was born in Bremen, I really wanted to stay there after my degree. So I convinced my sister, who was already a fully certified optician, to open up our first optical store in town: Augenblick Optik. And since making a living off half a store was not feasible, I opened a second store and went solo this time: Stil Plus Optic, a small and upscale boutique with a fashion angle right on Bremen’s market square. Marc Oliver, you’re the younger brother. Was it a natural choice for you to follow family tradition? Marc-Oliver: No. Right at the start, it wasn’t clear at all that I would follow my older siblings into the optical business. Right until finishing high school, I was totally focused on playing tennis. But the bleak future prospects of becoming a pro and the many failed tennis coach careers here in Germany made me think twice. After finishing school, I wanted to get some kind of practical training. Because our dad already owned five stores, I had gotten a taste of the practical aspects of working as an optician. While working towards my certification as an optician in Bremerhaven, I also spent three days per week working with Hauke and Bettina at their store, which have me the much-needed practical insights quite early on. When I turned 23, I moved away to Hamburg to study for a degree in Industrial Engineering. But that career switch would have left a big gap, since there was now a certified optician without a store in the family. And that was a straight no-no. Hauke had been dreaming of opening a store in the Schanze neighborhood for years and I also saw great potential in the concept. So I went scouting locations around here. That’s how we ended up finding the former spaces of a Turkish butcher – and signed the lease within a matter of two hours. That was back in 2006, and that’s how Six Million Glasses started. What’s the best thing about working as an optician? And are there any downsides? H: I really enjoy developing strategic business concepts and then selecting the perfect location to open the perfect store with the optimal design and product line-up. For me that’s always a great challenge and I particularly enjoy working on the design and implementing it in cooperation with agencies. M-O: I’m really intrigued by the diversity of all the tasks at hand. From sales to the craftsmanship all the way to design and interior decorations – it really covers all angles. I don’t know if any other job provides this much diversity. 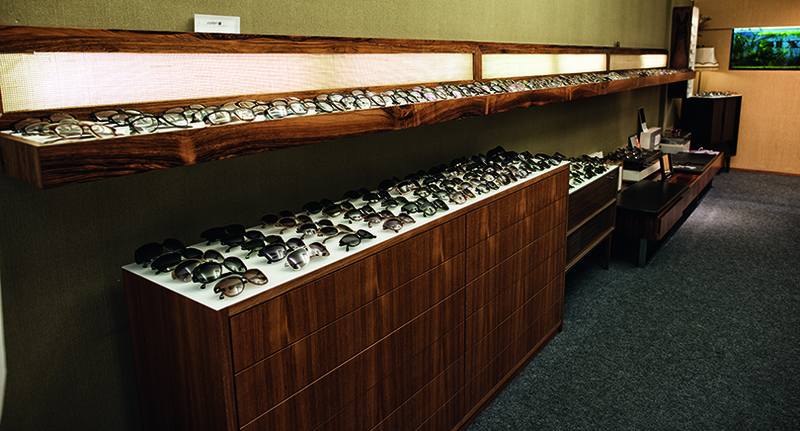 Six Million Glasses is one of the most progressive opticians in the entire country. But the Schanze location is not your family’s only retail store, right? H: The Peters family has been selling eyewear since 1996 at Augenblick Optik in Bremen, since 1999 at Stil Plus Optik in Bremen, since 2006 at Six Million Glasses, and since 2010 at Neonbox Optics in Hamburg Ottensen. That should be plenty for now. Do your stores share the some concept or do you switch it up depending on location? H: Every store follows its own concept and offers a product selection suited to their respective location and customer base. 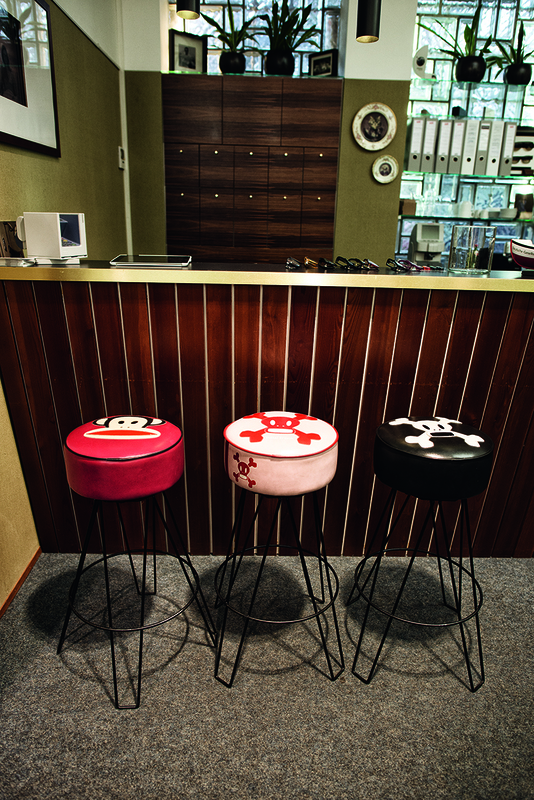 Every store has a different style of product presentation and brand selection. Your store and you two as personalities really stand out in the broad mass of opticians. Were you certain that your concept would work right from the start, or were there doubts at some point? M-O: We actually never had any doubts that it would work. How would you describe the philosophy behind Six Million Glasses? M-O: Relaxed, casual, and passionate. Looking at your employees, they all seem to like it. Is there a system behind managing your employees? M-O: The system is pretty much that everyone can be themselves – employees just as much as customers. Here and there, a street artist will walk into the store with harlequin clown shoes with bells on them. The Schanze neighborhood encourages equality of all ethnic backgrounds, genders, and age groups – and that’s exactly what we stand for. Speaking of equality, how do you divide up tasks at the store? H: Our employees do the work, we chill and grill… preferably at the pool or the beach. That’s why we picked Hamburg. Haha, speaking of the beach: What’s your share of sunglasses in the overall line-up? What’s your take on the future of prescription eyewear? Will customers migrate towards contact lenses or Lasik surgery? M-O: That might be true, but at some point they will end up needing glasses anyway. I consider Lasik surgery and contact lenses as supplements to the eyewear market. Over the years, eyewear has also advanced from plain medical device into a fashion statement. Which is exactly why customers come to us. M-O: Our customers are a diverse mixture from students, to managers, all the way to former senators. Most of all, we get people involved in the arts and media, as well as advertising. Most of them have a pretty liberal attitude – they’re smart people. When it comes to selling to smart customers, do they have a clear idea what they want, or are they open towards individual counseling? M-O: Purchase decisions tend to be made based on personal advice. Even professional stylists who come by the store to lease eyewear for photo shoots – around ten per week – like to get our opinion. Do you put an emphasis on close communications with your customers? H: We like to take them out for drinks. No, seriously, we are planning to launch or own fashion blog and only have an outdated website at this point and around 900 Facebook fans. Your selection is rather eclectic. What are your favorite brands, and do you recommend those to customers? M-O: Most definitely! REIZ, GARRETT LEIGHT, DITA – all companies that are independent with minimal design and maximum craftsmanship. We seek out labels who manufacture under fair conditions with short supply chains, also including brands from Germany. In my opinion, REIZ is by far the most sustainable company on the market right now. Hauke, you also work as a sales rep. Which labels do you work with and in which region? H: In 2009, the guys behind REIZ asked me, if I wanted to cover the North of the country for them, and after long deliberations I finally said yes. But that only became possible because my sister agreed to running our store by herself. Working in sales and several stores just wouldn’t have been possible. At the time, REIZ was working with very few stores up here in the North, so I needed a second label. Since we were selling lots of PAUL FRANK back then, my 41-year-old self put in an application with Baumvision and after some tenacious back and forth got the green light via text message. Have your experiences as a sales rep had an impact on your work as an optician – and vice versa? H: Absolutely. The experience as a rep has made me rather humble. As an independent optician who gets the first taste of success right away, you tend to think that you’re god’s gift to the business who has all the answers, while others are just lame and in the dark. That’s actually not true; lots of colleagues out there are doing lots of things really damn well. Where do you see the overall trend in the optical business? H: There will always be the classic optician in his apron, focused on his workshop and technologies. But concept-based opticians are winning more and more market shares. On top of that, REIZ is aimed at a rather special customer base, since the brand story needs to be told with appropriate sales support. Is there ever a conflict of interest between your two jobs? H: That’s what I initially expected, but just the opposite was the case. Since I spend time serving customers at our store and do my best to keep inventory at a realistic levels, I can understand what my opticians need. They are all really fair and appreciate one another’s work. And through all those years I only met one person who thought she was better than everyone else. And that was in Berlin. As a sales rep, you really know the needs from a brand perspective. What do brands want from their opticians? H: They want opticians to make a clear commitment to a brand’s portfolio and work with it accordingly. That means cultivating the line-up is the main key to acceptable revenues. Not an easy task with the multitude of brands out there. 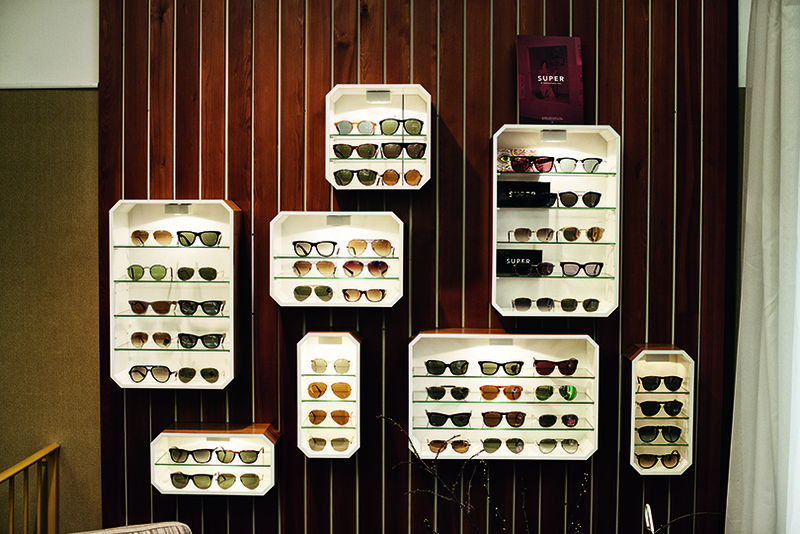 How do you select the brands for your optical store? M-O: We really put an emphasis on great brand presentation, respectful and not too pushy employees, great craftsmanship and price/performance ratio for us, as well as our customers. Is there room for experimentation when it comes to trying new labels? 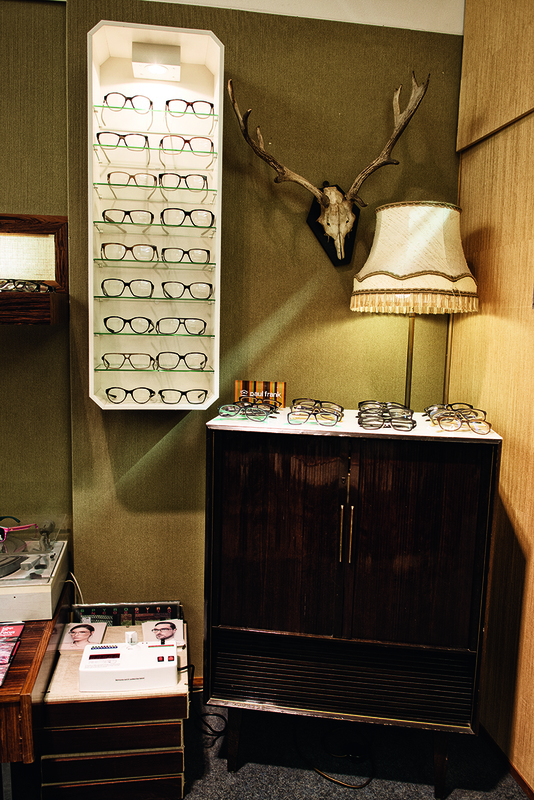 M-O: Early on we were surely among the top three opticians in Germany when it came to bringing in new brands, for instance Booth & Bruce or Goldsmith. Nowadays we like to take our time, about one to two years. Is there anything most brands tend to neglect in your opinion? And what impresses you the most in the business? H: When my colleagues, with whom I’ve worked as a sales rep and optician for many, many years always keep their word, always keep it square and endure all the nonsense I tend to spew out on a regular basis. be fashion-oriented but at the same time enjoy longevity on the market? H: By walking the walk of sustainable customer retention. Which labels are doing a great job at it in your opinion? H: Only a select few, since the owners and designers generally like to steer clear of the customer and leave it all to the distributors, instead of spending some time at the actual store to see how their products are being sold to end customers. Do you notice any brand loyalty among your end customers? Meaning, do any customers specifically ask for certain labels at your store, or is it more about the individual fit, style, and price? M-O: We certainly get these customers. Once a customer has made a particularly great experience with a certain label, they’ll buy a second or third pair of glasses from them. But that’s pretty much it in terms of loyalty since fashion-oriented customers are always looking to try out some other designs as well. Is there a newcomer brand on your radar right now? H: Shhh… I can’t reveal to much at this point. But check our window display in about three months, okay? Thanks a lot for the interview, guys!